New technologies are the ideal way to broaden student skillsets and arm them with practical experience for their future careers. Laser cutting is a universal tool that has become increasingly important in many industries. In secondary schools it complements several subject areas, including design and technology, engineering, textiles and art. But, what is it that makes a Trotec laser the perfect fit for education? Ideal for processing a wide range of materials and applications, Trotec lasers cut, mark and engrave almost any material. From cutting plastic laminates and woods used in design and technology, to engraving coated metals for engineering and even cutting and engraving textiles for fashion and art projects. What’s more, Trotec lasers can turn designs into reality in the blink of an eye, offering high speed processing that most other machines available on the market don’t come close to achieving. A Trotec laser is also low maintenance, thanks to InPack TechnologyTM which offers maximum dust protection ensuring longer lifetimes for components. Thanks to the fully enclosed housing, Trotec machines are class 2 laser systems and therefore extremely safe to use. The winner of Trotec’s competition will benefit from a substantial UK customer service and technical support team. With 6 regional showrooms throughout the UK and Ireland, and a network of highly skilled technical service engineers, Trotec is committed to making sure that their customers from all industries remain productive and hassle-free. The Trotec team has a wealth of industry experience within the supply of laser technology and sheet materials, offering dedicated training days at regional showrooms to ensure that customers are fully trained, perfect for training a team of people, offering refresh courses and ensuring new staff are fully adept with the laser machine. A Trotec laser will not only benefit students, but staff. Thanks to the broad range of applications possible, the laser cutter can be used to create everything from signage for the school to student awards. It is possible to develop after-school programmes around the machine and to complete projects for school fundraisers such as branded merchandise. 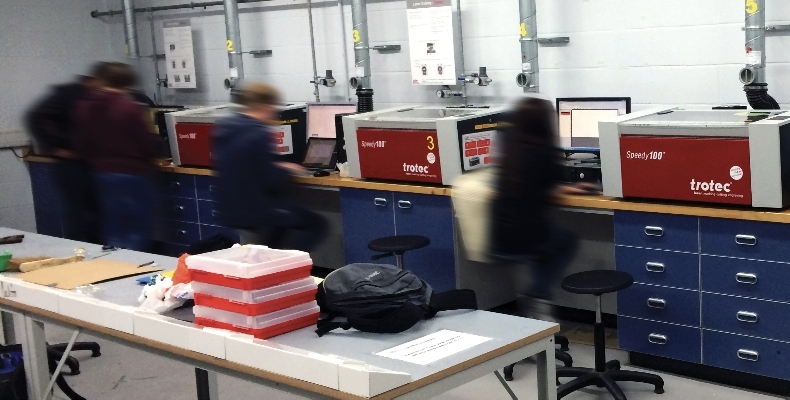 Whether you are looking to broaden your range of available technologies in class or replace your existing machine, a Trotec laser is a reliable all-round tool to give students transferable skills and comes complete with excellent UK-based customer service and unrivalled peace of mind. To be in with a chance of winning simply visit our online form and enter your contact details before 30/06/2019. Terms and conditions apply. Laser subsidies from Trotec Laser Ltd. 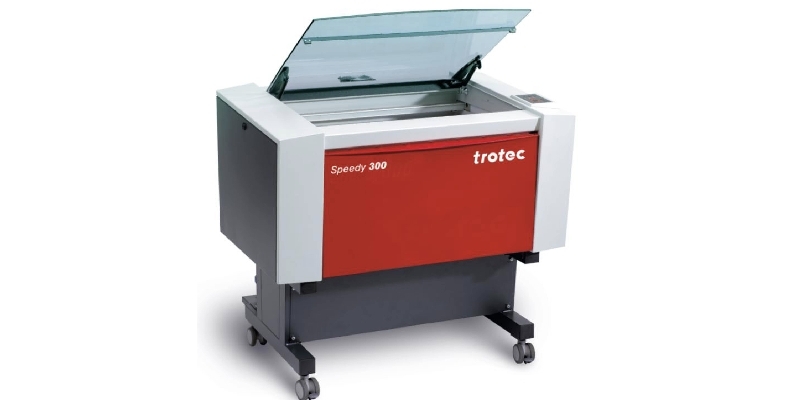 If you don’t have to leave it to chance that you will win the laser cutter competition for your school, Trotec are offering a hefty £10,000 off the Speedy 300EDU model for 25 UK secondary schools in 2019. The Speedy 300EDU is a new laser cutter tailored for secondary schools. Featuring an 80 watt CO2 laser source and a 726 x 432mm working area, all common materials can be processed using the new laser cutter. This compact but productive laser system is available only to the education market and until September 30th 2019 Trotec is offering 25 subsidies of £10,000 towards the purchase for secondary schools in the UK and Ireland, making it a cost effective solution for integrating high-speed laser processing into the curriculum. The 300EDU can be purchased with a range of additional accessories, including additional lenses, cutting tables, a rotary attachment for engraving round objects and the JobControl Vision Camera software, allowing for easy processing of printed materials, at an additional cost. This machine and the full range of Speedy lasers are available for demonstration at Trotec’s 6 regional showrooms throughout the UK and Ireland. To avoid disappointment and to register your interest today, call 0191 580 1182 or complete our online form. Sony has launched a new projection technology, the VPL-FHZ55: the company'™s first lampless projector using 3LCD-imaging technology.